This is what it’s come to for UNLV. 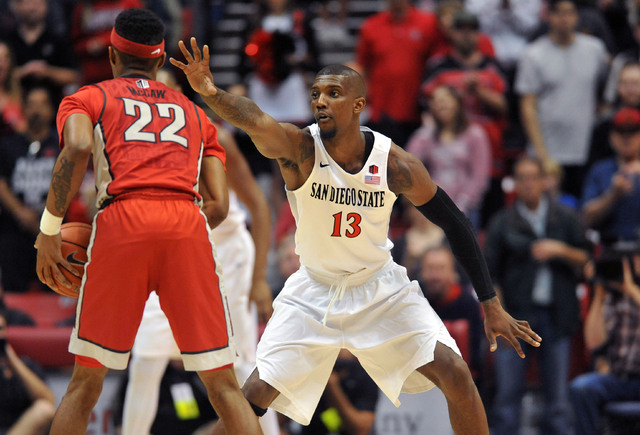 The Rebels didn’t substitute until 3:09 remained in the first half, and by that time the mystery had been taken out of Saturday’s regular-season finale, San Diego State well on its way to a 92-56 victory. 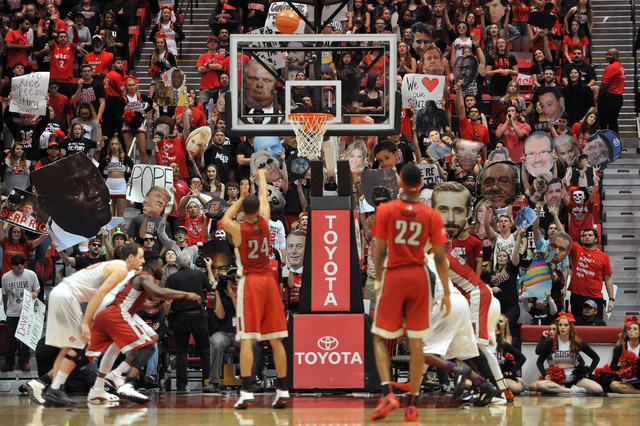 SAN DIEGO — This is what it’s come to for UNLV, the Rebels going to the student body to get a warm body. They snatched 6-foot 11-inch Bryan Glenn off campus, who last played in the 2011-12 basketball season as a walk-on. 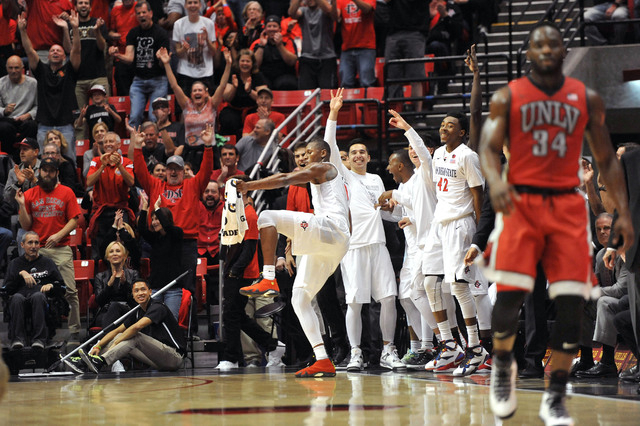 Not that UNLV’s coaches wanted to use their bench players. 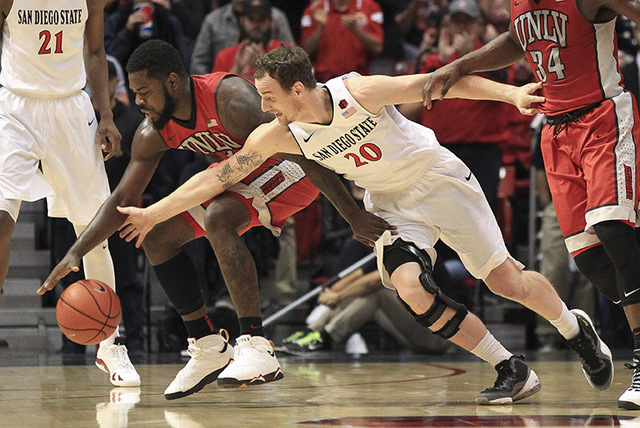 The Rebels didn’t substitute until 3:09 remained in the first half when Austin Starr was sent onto the Viejas Arena court, and by that time the mystery had been taken out of Saturday’s regular-season finale, San Diego State making 13 3-pointers on its way to a 92-56 victory. 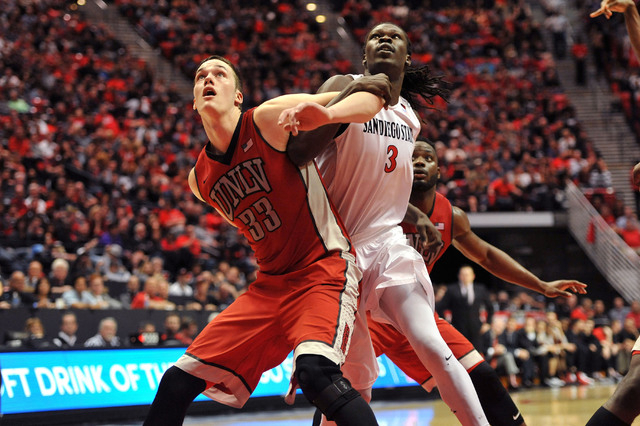 The loss was UNLV’s worst since a 96-52 defeat to Utah on Feb. 21, 2000. 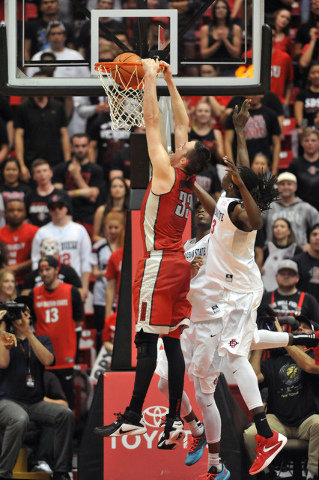 UNLV (17-14, 8-10 Mountain West) will be the seventh seed in the conference tournament. The Rebels will face No. 10 Air Force (14-17, 5-13) at 1:30 p.m. Wednesday at the Thomas & Mack Center. The teams split the regular-season series. How many players will suit for the Rebels is one of the major questions. 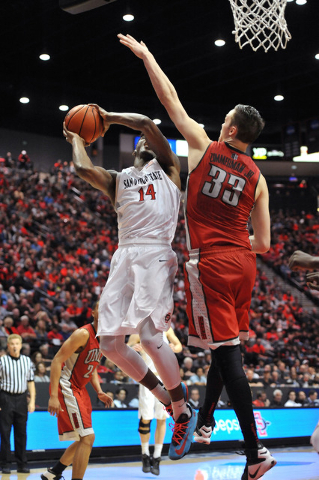 Jerome Seagears didn’t play against the Aztecs (23-8, 16-2) because of a lingering injured right heel. He had been playing with the injury, but hadn’t been practicing and then was ruled out after Saturday’s shootaround. Freshman Jalen Poyser received his first start. The Rebels also hope to get back Dwayne Morgan, who has been out since Feb. 20 with a separated right shoulder. Then there’s the Derrick Jones Jr. situation. He isn’t likely due back after the NCAA ruled him ineligible Monday after the American College Test vacated all the scores at the Baltimore site where he took his exam. 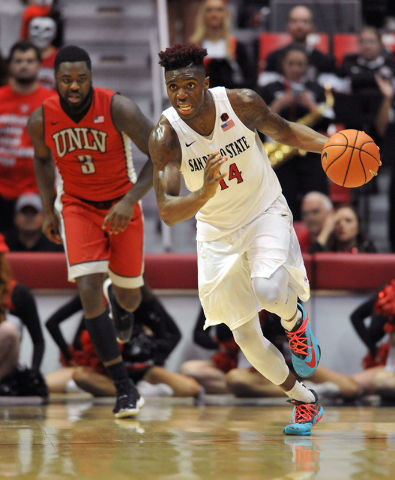 UNLV played only five scholarship players against San Diego State, and four of them were credited for 20 minutes of playing time in the first half. Stephen Zimmerman Jr. was one of the four, but came out for about 10 seconds when Glenn was briefly put on the court. With the game out of hand late, Simon went to his bench and wound up playing three walk-ons — Glenn, Starr and Barry Cheaney — at the same time. It was not a fair fight against a San Diego State team that had the luxury of spreading out the playing time, with eight players getting on the court for at least 10 minutes. 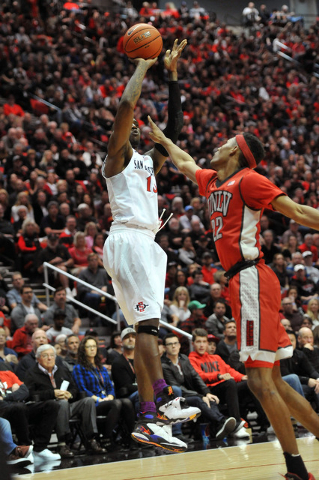 UNLV actually gave the Aztecs a little bit of a game early, with McCaw making back-to-back 3-pointers to put the Rebels ahead 14-10. 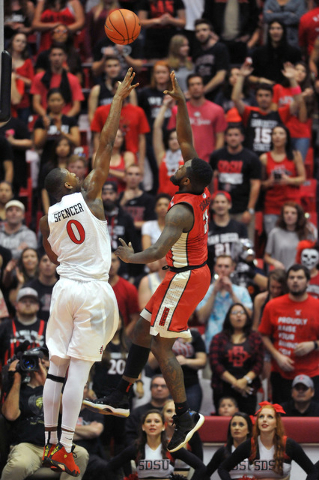 But then the Aztecs took over, immediately going on a 17-4 run to seize control. 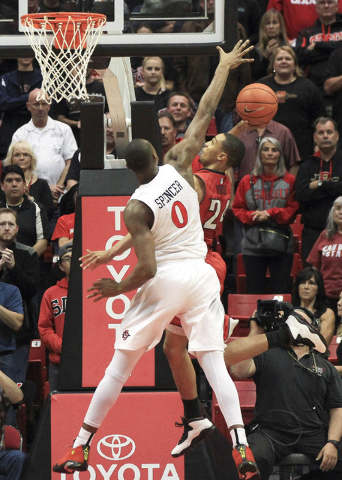 San Diego State closed the first half with Malik Pope stealing the ball from McCaw under his hoop and slamming in the basket to give the Aztecs a 42-27 lead. They made it even worse in the second, outscoring UNLV 50-29 and going up by as much as 39 points. McCaw led the Rebels with 21 points, and Zimmerman finished with 11 points and 11 rebounds. 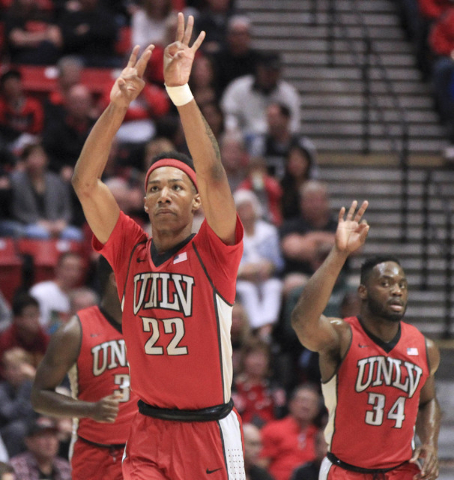 UNLV made just 30.4 percent of its shots and was 4 of 29 from the 3-point arc. 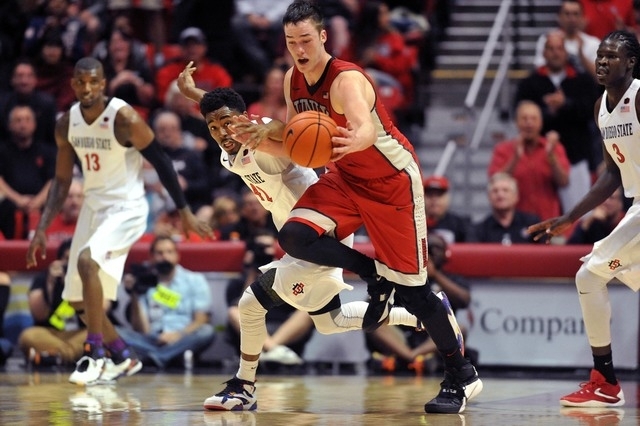 Winston Shepard and Trey Kell each scored 18 points for San Diego State. Shepard played for Simon at Findlay Prep. UNLV is searching for a coach, and Simon is expected to be a candidate. 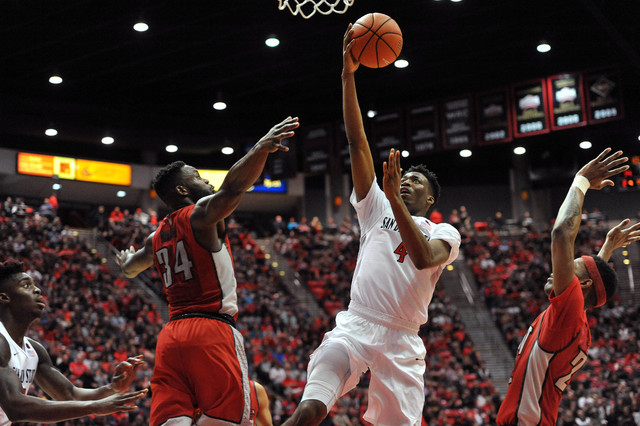 The Aztecs took advantage of a depleted UNLV team on a night when it all caught up to the Rebels. “We have such a small margin for error,” Simon said. “It’s not like we can go pressure 40 feet or play 94 feet anymore. It’s not like we can get in the passing lanes with five guys, so you’re basically packing it in. You’re playing some zone. And then you’re hoping that you can rebound against their size and length and they’re going to miss contested threes. 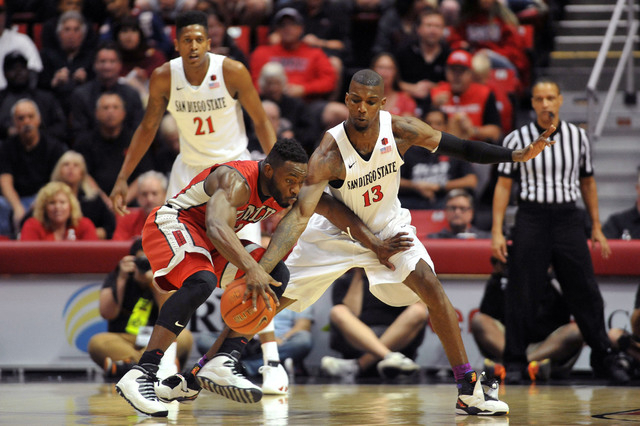 Check our GameDay page for full coverage of the UNLV-San Diego State game.